Moneyslane boss David Johnstone says Saturday’s victory was one of the biggest results in the club’s history. Slane defeated Glentoran Seconds 6-2 in Saturday afternoon’s Intermediate Cup second round tie. Johnstone said it was a special day for the committee, fans and all those involved with the club. He also was quick to remind himself that it was a very young Glentoran side but still an incredible achievement for Moneyslane. Moneyslane took the lead inside 15 minutes when a Gareth Rees header broke the deadlock. Only 10 minutes later the lead was then doubled through another Rees header. And it was 3-0 before the half time whistle when Gregg Harrison closed down a Glentoran back-pass, the ball fell to Brian Quilty who did very well to score from 25 yards out from a tight angle. The second half began and Glentoran came out fired up and up for the cup tie. They soon had a man sent off for dissent, but did pull themselves back into the game and scored from a penalty to make it 3-1. With 65 minutes gone Glentoran scored their second to make it 3-2. Moneyslane then got the next crucial goal when Darragh Peden scored a half volley from a Greg Harrison flick on which initially came from a Brian Quilty free kick. The Moneyslane goals kept coming and it was soon 5-2 when Man of the Match Brian Quilty scored his second of the afternoon when he met a Stephen Coulter cross. 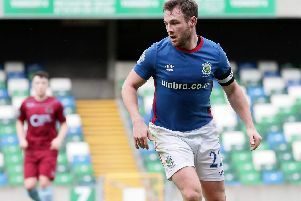 5-2 soon became 6-2 when Richard Nesbitt broke through and went one on one and coolly drove past the Glentoran keeper.